The Coalition's original debt target has been met. 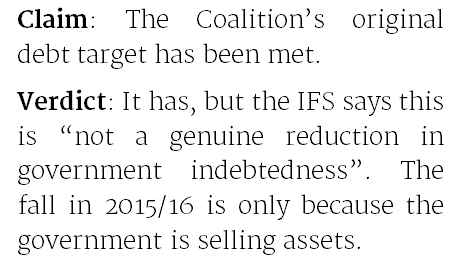 It has, but the IFS says this is "not a genuine reduction in government indebtedness". The fall in 2015/16 is only because the government is selling assts. For the first time since 2012, the government is forecast to meet its original debt target. It had aimed to get public sector net debt falling as a share of GDP in 2015/16. 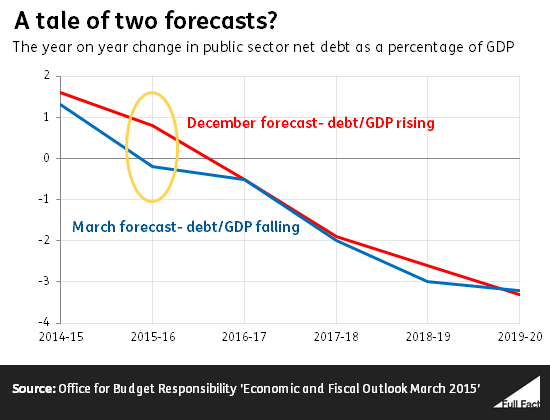 The December forecast from the Office for Budget Responsibility (OBR) said this wasn't going to happen. Yesterday's forecast predicts that it will. A few things have changed since December, but the main driver of this apparent success is the government's decision to sell £20 billion worth of assets in 2015-16. This means selling things like some of the government's shares in Lloyds Banking Group. But the OBR makes clear: "Financial asset sales bring forward cash that would otherwise have been received in the future in the shape of mortgage repayments and dividends, so they only temporarily reduce the debt-to-GDP ratio. In broad terms, they leave the public sector's net worth unchanged." The Institute for Fiscal Studies agrees, saying this is "not a genuine reduction in government indebtedness". The debt is forecast to fall anyway from 2016/17, but the Chancellor's announcement isn't as exciting as it might seem.